For as long back as I can remember I have struggled been challenged with problematic knees. Most of the time I take solace in knowing that there are definitely individuals out there having much more difficulty with their knees than I am, so far no surgeries have been required so I really try not to complain. However, after almost a full year of a pain free existence having my knees starting to speak up again is completely aggravating. I think the most annoying part through all of this is having to go to the doctor. After a good but not particularly “over” strenuous leg day I was unable to straighten my right leg due to knee pain so I finally caved and made a doctor’s appointment to get it checked out. I find that I often go to the doctor for these issues and either get passed around to a million different doctors or specialists or I am given the advice of stretching. It is kind of like when you are sick but the doctors have no idea what is wrong so they tell you it is a virus and there is nothing that they can do so you should stay hydrated and rest. Such an unsatisfying answer, well that is what it generally feels like when I get my knees checked out. Anyways, perhaps you are wondering why I am writing about this? Maybe you are wondering if I am just going to complain and whine for the next 500 words, but don’t worry I won’t. My knees and I have issues but there is no need to take up more time than necessary complaining about it here, that is why I have a loving husband, he gets to listen to me wine and complain, and gets to smell my Rub A535 and Icy Hot knees. I am writing about my knee pain as a bit of a reminder to take care of ourselves. Now I am a self professed “stick-to-it-ness-er” (yup made that word up), and I am pretty sure I always have been. I often like to see exactly what I can get out of myself before I absolutely have to back off. I know it isn’t always the best approach and I am working on it, constantly reminding myself that recovery is just as important as progress, in fact recovery is essential to progress. Although I do feel that it is essential to push yourself and encourage yourself to go places where you are unsure of success it is also important to stop and take care of yourself. In my case I have continued to workout but kept an eye on my knees. I try my best to be gentle while still making sure I am pushing myself where I can, without pain. The “without pain” is the key here. I have said it before and I will say it again, it is so so very important to listen to your body and to hear what it is saying. Listening is useless if you aren’t going to let yourself hear what your body is talking to you about, this is a lesson that I have learnt the hard way and in the past has cost me several days, weeks and months of training. I am stressing the importance of listening and hearing pain because pain is there to stop you from injuring yourself more than you are potentially already hurt. Yes, sometimes there are situations where it “hurts” (ex: foam rolling) however something that hurts or feels uncomfortable isn’t always necessarily “pain”. 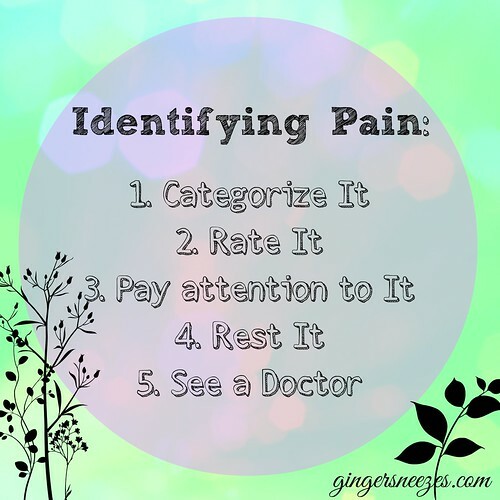 So it is important to identify what pain actually is. Here are some tips at identifying pain that might help you be a bit more open to listening to your body’s signals, especially if you are stubborn like me. Categorize the pain. Is it a stretching pain? is it a stabbing pain? burning? pulsing? Rate it. On a scale of 1 to 10, with 1 being “this itches” to 10 being “I can’t walk someone please help me”. You pain index shouldn’t ever go beyond a 7, even with stretching. Pay attention to it. Don’t ignore the pain signals, acknowledge what is going on, maybe mark it down in your workout program or your day planner. Trying to narrow down what is causing the pain can help you avoid it in the future or correct the issue in the present. Rest it. The pain signal could very well be your body asking for a break. So rest it, ice it, elevate it, do something that feels good to that pain. See a doctor. If your pain isn’t letting up it is time to seek professional help, sure it is annoying sitting in that waiting room, but your doctor hopefully knows more than you do about the body and should be able to help you find a solution. I hope these tips help you next time you are experiencing some discomfort. Note: Although seeing a doctor is listed as the 5th element on this list this does not mean Gingersneezes.com is recommending that seeking a doctor’s recommendations be left till the end, nor is it meant to symbolize an order of importance. If you are concerned about any aspect of your health and fitness please seek advice from a healthcare professional. This entry was posted in General and tagged health, healthy-living, knee, living, management, pain by healingginger. Bookmark the permalink.